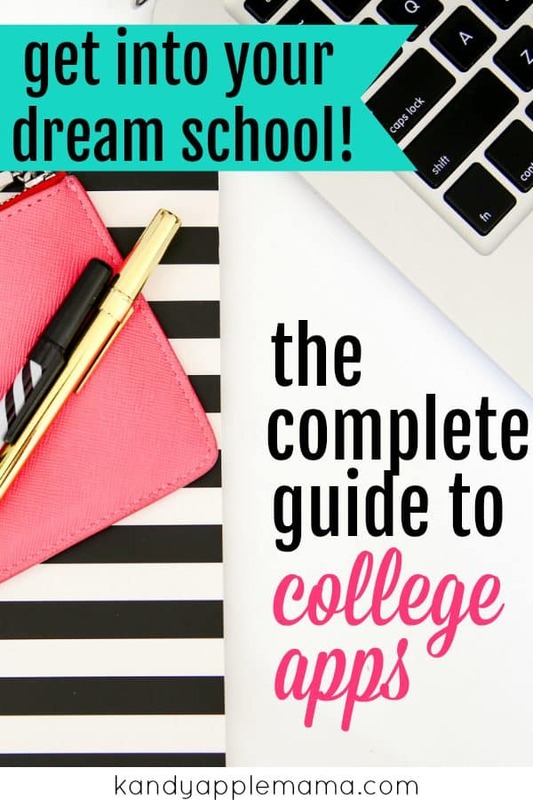 Whether you’re stoked to finish high school, completely terrified of applying to college, or eager to get back in the educational ballgame, applying for college is a lengthy, intimidating process. I’ve broken said process down into manageable chunks for you, to help make the process less intimidating. So take it step by step and don’t get overwhelmed. This is an exciting time! I want you to cherish every memory you make right now! I know a thing or two about the college application process. I started undergrad in California in 2008, and I was equally excited, eager, and ignorant about the “real world”. Terrified, trembling, and lonesome also accurately described how I felt. I didn’t know anyone at my new school, and I was 1600 miles, 2 time zones, and educational leagues from anything familiar. My sophomore year, I had the opportunity to live and study in Washington, D.C., at the school’s campus just a few blocks from the White House! I interned on Capitol Hill for a congresswoman, toured the House, Senate and Supreme Court, and experienced incredible cultural and historical opportunities I couldn’t have dreamed of. In 2012, I graduated with a Bachelor of Arts in Political Science and a Bachelor of Arts in Sociology. 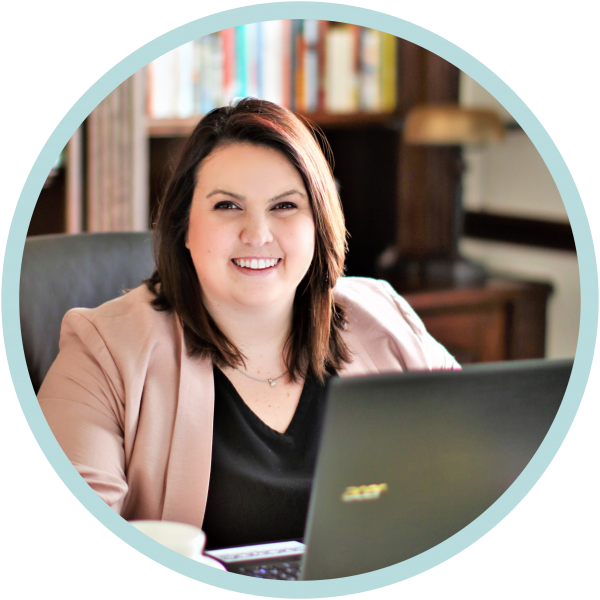 After a gap year spent working, I started an online Masters education, ultimately earning my Masters of Business Administration in Management in 2016. I’ve spent time tutoring middle and high school students since 2011 and most recently coached a long-time student through her college application process. She was just admitted to Southern Methodist University, and I couldn’t be more proud! She worked so hard to achieve her goals. I’m a huge proponent of education in and out of the classroom. Now I know that formal education has its place, but I also recognize the true importance of at-home learning and common knowledge lessons. I highly recommend talking to your children about college when they’re young. Prepare them for higher education before they’re old enough to argue with you about it! Ha! Get your kiddos excited about their potential and their possible future careers! You can even walk college campuses with them and dream about what their adult lives will look like. As their parent, it’s your responsibility to instill a passion for learning and education in your children – which is no simple task! I am passionate about education in every sense and truly admire you for your commitment to attend college and your courage to seek help with the process! I recommend starting your college search 12-15 months prior to the semester you want to start school. This will give you plenty of time to make an informed decision and submit a thorough, complete application without rushing. Throughout the rest of this post, I will walk you through each step from how to choose the right program to completing your application. Once you’ve completed your application and paid the application fee (or had the fee waived), you’ll want to move to the FAFSA and apply for federal financial assistance. You’ll also work on applying for external scholarships and properly celebrating when you receive your acceptance letter! Some are bred into a family college. My aunt and uncle met at Texas A&M and birthed only Aggies, for example. What a relief for my cousins! They didn’t have to battle it out to figure out which school they wanted to attend (plus, alumni scholarships are awesome!). But for those of us that don’t know which college we want to attend when we’re in diapers, choosing the right school is a daunting task. If you want to attend a community college, I recommend Googling “community college” + the city you want to live in. Start reading through the schools’ websites and look up their locations to determine the best fit for you. You can always contact someone in admissions to get a better perspective on the school or to sign up for a campus tour. When I began my college search, I was at a total loss. I knew I wanted a 4-year school, and I knew I wanted to study Political Science. But after that? I had to really think about what I wanted. I didn’t want to go to a college with sororities and fraternities (think: Elle Woods). The school’s campus needed to make me feel at home. It couldn’t be located in a climate that was too hot or too cold. A liberal arts curriculum would suit me better. I really liked smaller classes and didn’t want to have huge lecture classes where I couldn’t interact with the professor. I didn’t really want to stay in Texas, but I was open to the idea. And, I definitely didn’t want a party school. Okay, so I had my list. I’m pretty sure I can’t just Google that list and get the magic answer. The next best thing? The Princeton Review: The Best 381 Colleges, 2017 Edition: Everything You Need to Make the Right College Choice (College Admissions Guides). I went through every single college in this book my senior year (what up, 2007 edition)–back then, there were only 361 colleges to read through. This book is the gospel of colleges. You can see average ACT/SAT score and GPA for admitted students, you can read through real students’ reviews, gather data on admissions deadlines and financial aid availability, and my favorite part: catch the quick details of the social scene on campus. Personally, I wouldn’t rule out a school just because of the tuition cost. Check into the school’s financial aid first. I almost didn’t apply to Pepperdine University because the tuition was 50 grand when you included housing. My mom convinced me to put my application in anyway, and the school ended up offering me such a large grant that tuition was effectively cheaper than in-state tuition would have been at a Texas public university! Be realistic about what’s feasible, but don’t give up on your dreams before they’re proven out of reach. I flagged the schools I liked and did a deeper analysis from there. Read up on each school individually, complete a cheat sheet for each school, and do an overall rating. I housed all of my school sheets in a binder and kept them organized in order of preference. This is the template that I used – grab a copy for FREE! 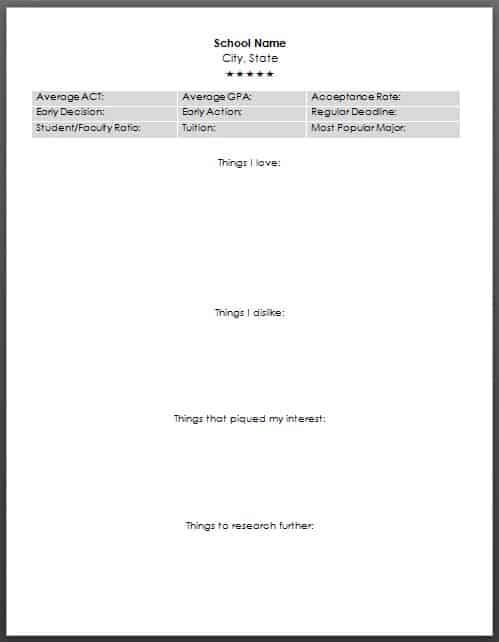 Subscribe to Get Your FREE College Binder Template! Exclusive for Stepmomming subscribers, a FREE college rating template sent directly to your inbox! In fact, when you subscribe, you’ll get access to ALL of our freebies! Don’t forget that when you compile your list of schools to apply to that you will need a safety school as well. This is a school you are definitely guaranteed to get into, just in case. I also recommend applying to a stretch school. I was accepted to all of the schools I applied to, and I always wondered “What if I had applied to that one nearly-Ivy on the West Coast?” Luckily, I loved my undergraduate experience and have no regrets, but I definitely recommend applying to a few different options just in case! The first step to completing the application is locating it! If you didn’t find the application information in your Princeton Review guide, I recommend Googling the college name and choosing the search result for the web address that ends in .edu. Once you’re on the school’s website, look for “Admissions,” “Admissions and Aid,” “Undergraduate Admissions,” “Prospective Students,” “Getting Started,” or anything else similar! You can also use the search bar to look for admissions-related web pages. The school wants you, so they shouldn’t make it too difficult to find their admissions page! Many colleges have moved to requiring the Common Application instead of a unique university application. If that’s the case with the college you’re looking at, this works to your advantage! Spend hours on the Common App and hit submit to multiple schools at a time! Work smarter, not harder! Visit www.commonapp.org and click on the bright green Apply Now button to get started. You’ll need to create an account. Once you’ve created your account, click on My Colleges. You’ll want to complete the College Search to add the schools you chose. Review each school’s details: deadlines, fees, and the additional application requirements (e.g., personal essay, teacher evaluation, or counselor recommendation). I highly recommend writing up a list to keep track of it all. Next, head to the Common App section. Here, you’ll have 6 sections to complete: Profile, Family, Education, Testing, Activities, and Writing. This is the basic name, address, citizenship info. This part should be a breeze for you! This is also where you have the opportunity to apply for a fee waiver if you’re unable to afford your college application fees. You’ll enter information about your parents, siblings, and any children you have in this section. You’ll need to know your parents’ occupations and education levels. Alright, now it’s getting a little more complex. You’ll need your school counselor’s contact information, your GPA, graduating class size, current course list, any college classes taken (whether dual-credit through your high school or during the summer at a local campus), any honors received in high school, and your future plans, including career interests and highest degree planned. This is where you include all of the standardized test scores you intend to submit to the colleges to which you’re applying. This can include AP, SAT, or ACT, amongst others. PS: I will always recommend the ACT over the SAT. The ACT tests logic; whereas, the SAT tests facts, especially vocabulary. I recommend these three study books for the ACT. I’ve used the first two for their strategy tips and the third (the official ACT study guide) for the practice tests to give my tutoring students actual questions written by the test authors to practice. My copy of Up Your Score ACT has been used so much that the pages are completely ragged. I love the authors’ fun voices and the silly examples – it keeps students interested in the content. This is the fun part! Tell your future college what you participate in outside of class: sports, debate team, theatre arts, robotics club, church group, or volunteer work. Anything that you do outside of school that helps you stick out from the person applying before or after you, include it! They want to know about you as a person–not just your grades. Some schools require a personal essay, and you should see those schools listed on your Writing page if applicable. There are usually five essay prompts, and you’re given between 250 and 650 words to answer the prompt of your choice. Proofread, proofread, proofread! This is an opportunity to really let your personality shine, so don’t disappoint! This was the most intimidating part of the application process for me. I put it off until the last possible second because I was so concerned my essay would sound canned, would read boring, or would give the wrong impression. If you follow the ABC’s below, you’re guaranteed to write a winning personal essay. A is for Authentic. Speak in first person and use your own voice. Don’t be overly formal or overly casual; stay professional without sacrificing personality. Definitely have someone edit the essay, but don’t let adults supplement words that are out of your vocabulary! B is for Bifurcated. Make it personal. Your application is going to look similar to many other students’ applications. This is the part of the application where you’re able to stand apart and really show them you. Capitalize on this opportunity. C is for Compelling. Write a clear, compelling thesis. Your essay should work around this framework, and it should be as concise as possible and well-written. Feel free to use imagery throughout the essay. In fact, I even encourage real examples to portray your statements. Don’t just tell them – show them. If you want to be eligible for any financial assistance at school, you’ll have to complete the Free Application for Federal Student Aid (FAFSA). You can find the application at https://fafsa.ed.gov/. This is kind of like a tax return. The application basically determines your level of financial need based on you and/or your parent’s income level. It’s probably better to have your parents fill this out if you’re dependent on them, or you could play messenger and ask them all of the questions about their income. There are three different types of federal financial aid you could be offered: loans, grants, and work-study. I’m sure you’re most familiar with loans. The government pays for part of your tuition, and you pay them back after graduation with interest. Student loans get a bad rap because they can quickly add up with interest over years, but they initially offer lower interest rates to make higher education possible for more students. A grant is a payment for your tuition that you aren’t responsible for repaying unless you withdraw from school or otherwise default on agreed-upon terms. Also read as: We love grants. The government helps you find a job with the school to help you earn money to pay for said school. I personally participated in work-study and loved it. I was able to work with the Volunteer Center on campus and serve preschool children in under-served communities, for $10 per hour! What an awesome gig for a college student! You can also apply for scholarships outside of the government assistance or aid through your enrolled institution. You could earn as much money as you need for school through external scholarships. Many companies, organizations, and nonprofits provide annual scholarships to deserving students, so definitely apply for as many as you can! I want you to do some soul-searching. Do you fit any special demographics? Female? Christian? Latina? First generation college student? Was Dad a vet? Make a list of any special traits you can think of, so you can tailor part of your scholarship search to these niches. There will be less competition for the more specialized scholarships than the general scholarships that all incoming students are applying for. You should apply to as many scholarships as you can because there is a lot of competition out there. The smaller amount scholarships are more attainable because more people want the larger scholarships. Several small scholarships can add up very quickly, so don’t get discouraged. Plus, don’t forget that you can apply for scholarships within your university! Check with your admissions or financial aid counselor for more details specific to your school’s policies and procedures. Good luck with your college search and application process! I know it can be overwhelming, but take it piece by piece and step by step. Start early and give yourself plenty of time to complete the process. I understand that it’s a lot to manage, but you can do it! I’m so proud of you for taking this step and investing in yourself. You are raising a better generation. You are a better generation. PS: You should really check out all of the Adulting Series, all of those life skills we never learned in school. PPS: Learn about different ways to save money while you’re attending college! My daughter just finished applying to colleges. For the scholarships section, I would also add to look at your high school guidance office. She was able to apply to several scholarships with one application that are sponsored through our school district.